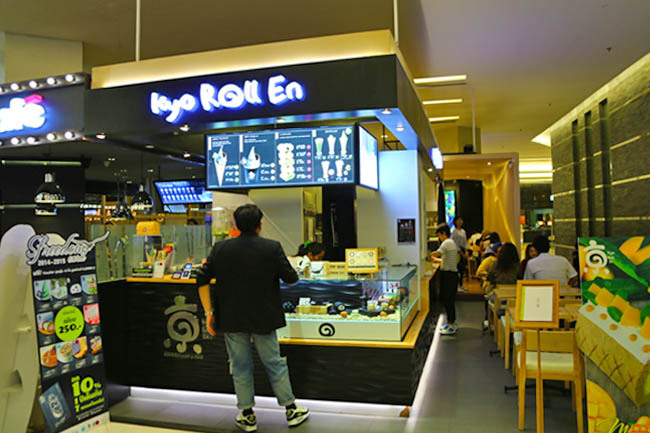 [Bangkok, Thailand] While Hong Kong has Via Tokyo, Singapore has AmaSoy and Tsujiri, Bangkok has Kyo Roll En. Undeniably matcha is still in. The Thais have always been forward in coming out with the creative and beautiful, even in food. And they have been quick in embracing pretty looking Japanese culture. 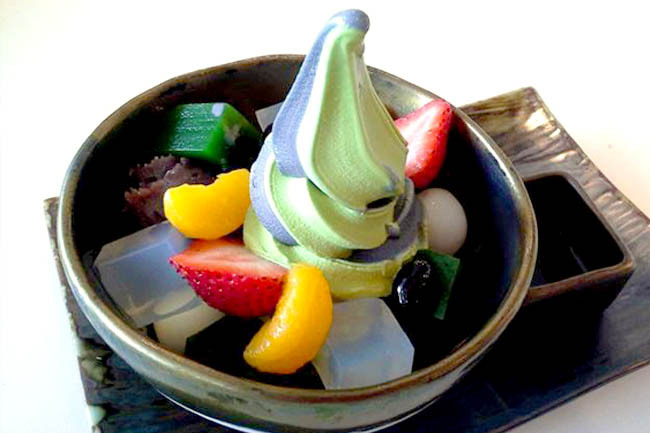 There it came, a green and black twist ice cream, made from Uji matcha green tea and sumi bamboo charcoal. I spot a glob of azuki red bean, shiratama dango (glutinous rice dumpling), a matcha nama chocolate cube (which reminded me slightly of Royce but not quite there yet), and a chocolate piece prominently displaying “Jin”, which is the shortened kanji for Kyoto. To be fair, I was more overwhelmed at how it looks than how it tastes, but it was well worth the money. The texture was smoothly lovely, didn’t melt too fast (as I was photographing for its best angle), and the toppings added elements of interest. My main wish was that the matcha could have been more distinct, ie bitter and less sweet. 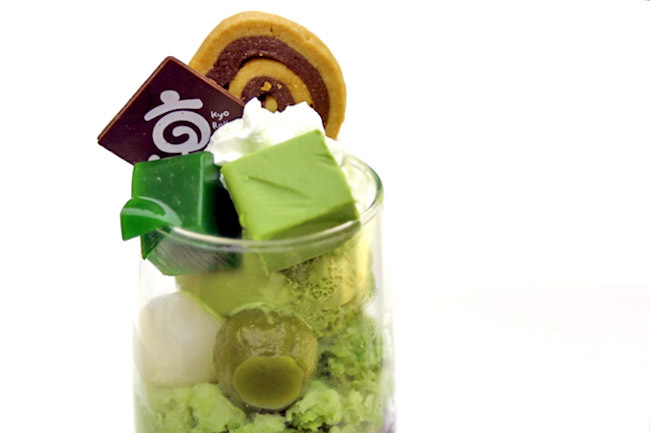 The very next day, I went back to try the Matcha Deluxe Parfait (229 baht). The price is considered expensive (SGD$9.70) for Bangkok, but it was futile to resist. 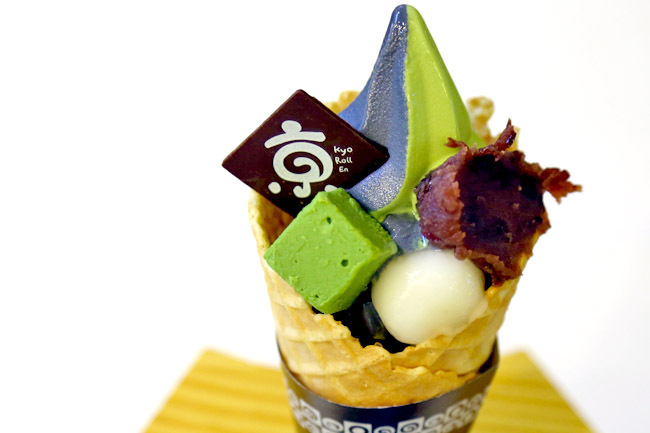 The parfait had an elaborate setup, layers of pudding, jelly, shaved ice, ice cream, red bean, mocha balls all intricately placed within a cup. A mixture of textures and temperatures from the top to bottom. 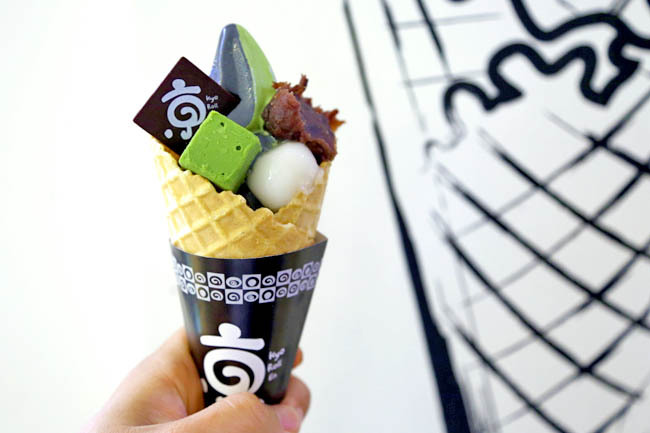 Kyo Roll En is based on the Kyoto Lifestyle Café concept, with signatures of soft serve and roll cakes. Not Japanese in standards of taste yet, but it achieved the effect aesthetically. Its not my first time to pay a quick visit this website, i am browsing this site dailly and obtain nice information from here every day.